When the streets of Helsinki were stormed by twenty pregnant Donald Trumps, as well as twenty gagged women, each one clad in hot pink t-shirts, people took notice. 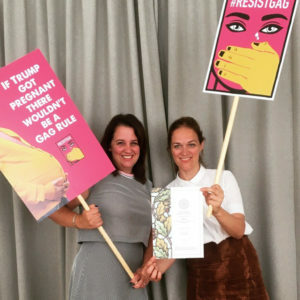 As documented on social media, as well as major news outlets like BBC, M4ID conducted a creative protest during the historic Trump-Putin summit in Helsinki last month in protest of Trump’s gag rule that dangerously impacts women’s health across the globe. 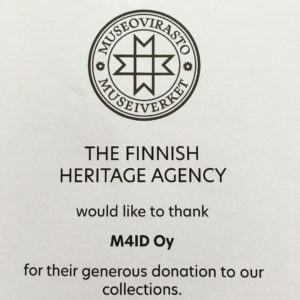 While M4ID was pleased with the buzzing amount of media coverage that turned their cameras towards us, we were particularly excited when we were asked by the National Museum of Finland to contribute a sample of our protest gear toward their collection. When a certificate of thanks arrived from The Finnish Heritage Agency yesterday afternoon, indicating that our contribution had officially been accepted, it was met with an overwhelming sense of pride and validation. Our creative team was thrilled to receive the document in the mail yesterday. Unable to suppress their excitement, they took a photo right away! M4ID looks forward to sharing information regarding the future usage of our protest paraphernalia in a display or collection. Stay tuned!